“Secret of Southampton” – The Best In Landscape Design 2011 Award Winner! Green Island Design has just received their second award for Best in Landscape Design 2011 from the Long Island Landscape & Nursery Assocation for this project in Southampton, NY! Check out the album or visit our website at www.greenislanddesign.com for more photos of this unique project. Sheer descent fountains spill into the gunite reflecting pools. 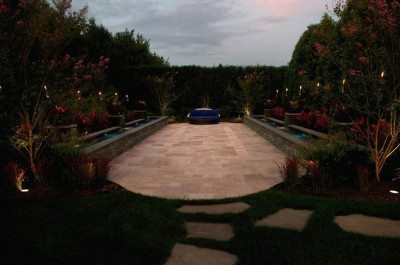 Low voltage landscape lighting highlights plantings with hybrid tiki torches and LED lighting recessed into the fountains. Sunset view upon entering the space from the stepping stone paths. View of the fountains with low voltage tiki torch hydrids flickering above. Low voltage lighting brings the space alive into the evening hours. Coloful tropical plantings surround the gunite reflecting pools and sheer descent water features.